Educational Qualification: Matriculation or equivalent from recognized Board. Age Limit: Minimum 18 years and maximum 25 years as on 13/11/2018. The candidates will be appointed on Temporary basis likely to be made Permanent. Both Male and Female candidates are eligible to apply. Candidates’ Selection: Selection of candidates will be through Physical Efficiency Test (PET), Physical Standard Test (PST), Written Test, Document Verification and Medical Examination. Application Fee: Candidates must pay Rs. 100/- as Application Fee. Fee can be paid through Online mode during submission of online application form by using Debit/Credit card or Net banking or any other option available. See officially released advertisement for more details. NO APPLICATION FEE REQUIRED IN CASE OF SC/ST/EX-SERVICEMEN/FEMALE CANDIDATES. The interested and eligible candidates may apply online only through the official website of Indo-Tibetan Border Police Force (ITBP) — www.recruitment.itbpolice.nic.in (See Application form’s link given below) from dated 15/10/2018 to 13/11/2018. ITBP Recruitment 2017 – Apply Online for 62 Head Constable Posts: Indo-Tibetan Border Police Force (ITBP) has given an employment notification for the recruitment of 62 Head Constable (Combatant Ministerial) vacancies on temporary basis. Eligible candidates may apply online from 14-10-2017 at 02:00 pm to 13-11-2017 at 01:59 pm. Age Limit: Candidates age should be between 18 – 25 years (Direct Entry) & upto 40 years for UR & OBC and 45 years for SC/ ST candidate of LDCE as on 01-08-2017. Age relaxation is applicable for SC, ST, OBC, Ex-Servicemen and other categories of persons in accordance with the Governments orders on the subject. Educational Qualification: Candidates should have Intermediate or Senior Secondary School Certificate (10+2) examination from a recognized Board or University or equivalent and Typing speed of 35 wpm in English or 30 wpm in Hindi only on computer. Selection Process: Candidates will be selected based on Physical Efficiency Test, Physical Standard Test & Trail Test. Application Fee: Candidates are required to pay of Rs. 100/- for Male candidates belonging to General (UR)/ OBC category through online payment gateway system on www.recruitment.itbpolice.nic.in. No fee for SC, ST, Females and Ex-servicemen candidates. Eligible candidates can apply online through the website www.recruitment.itbpolice.nic.in from 14-10-2017 at 02:00 pm to 13-11-2017 at 01:59 pm. 2. Go to News & select the desired post. 4. 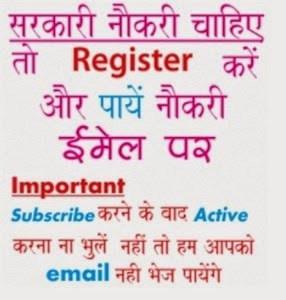 Click on “Register” for New Registration. 6. Click on “User Login” for Candidate have already registered. 7. Take a printout of online application form for future use. Walk in Interview for General Duty Medical Officer (GDMO) and Specialist Doctor Jobs at Indo Tibetan Border Police Force (ITBPF). Interested and eligible applicants have to attend interview on 08.03.2016, 25.04.2016, 06.06.2016. Candidates must have a recognized Medical qualification included in the first or second Schedule or Part II of the Third Schedule (other than that licentiate qualifications) to the Indian Medical Council Act, 1956 with relevant experience for Specialist, a recognized Medical qualification included in the first or second Schedule or Part II of the Third Schedule (other than that licentiate qualifications) to the Indian Medical Council Act, 1956 with compulsory rotating internship for GDMO. Candidates will selected on the basis of interview and medical exam. Candidates must have recognized Medical qualification included in the first or second Schedule or Part II of the Third Schedule of the Indian Medical Council Act 1956. Holders of educational qualifications included in the part – II of the Third schedules should also fulfill the conditions stipulated in sub-section (13) of the Indian Medical Council act 1956 with relevant experience. Candidates will selected on the basis of interview. Indo Tibetan Border Police Force (ITBPF) invites application form for 472 Constable Jobs. Interested and eligible candidates have to apply on or before 16 February 2015. The broadcast advertisement is given at itbpolice.nic.in. The applicants will be selected on the basis of written examination, Physical Test and Medical. The interested job hunters have to submit prescribed application available at official site itbp.gov.in and sent at address mentioned below…………..
Indo Tibetan Border Police Force (ITBPF) issues job notice for 79 Posts of Constable Posts. Interested candidates have to submit application form for on or before 21 November 2014. Minimum requirement is 10th pass for these posts. The online notification is given at itbp.gov.in. Guys before submit your application form must read all instructions carefully. The complete details of ITBPF Recruitment 2014 regarding posts, age limit, location, qualification/ experience, how to apply and where to send applications etc are mentioned below….. The Indo Tibetan Border Police Force (ITBPF) came into existence on 24 October 1962 under Ministry of Home Affairs (MHA), Government of India (GOI). The department has its official website www.itbp.gov.in. The candidate should be Matriculate (10th Class) or equivalent from a recognized board. The ITBP Force has recently issued Job notice for SI/ ASI/ Constable Recruitment. The details are also published in Rojgar Samachar dated 16/08/2014 and candidates can also check all information regarding the same here. The candidate should be 12th pass from recognized board or university or equivalent. 03 years experience as nurse. The candidate should be 12th pass physics, chemistry & biology as subject from recognized board or university or equivalent. The candidate should be 10th pass from recognized board or university or equivalent.